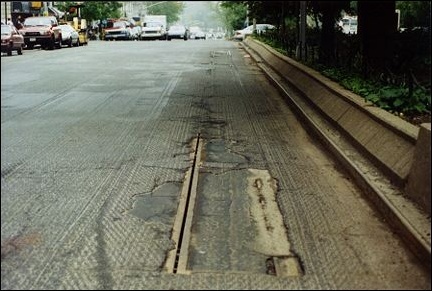 In April 1996, the City of New York began the process of repaving Broadway from 110th Street to 125th Street. 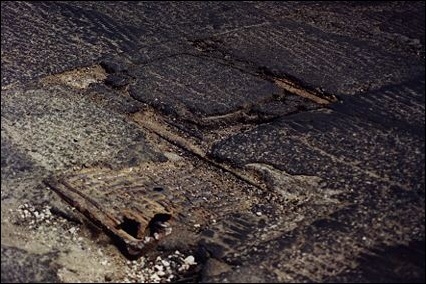 The first step was to ream off the upper layers of old pavement, to provide a rough surface for the new pavement to adhere to, and to keep the future new surface from being too high for the curbs. As their counterparts seek weathering in a sedimentary deposit, so may urban paleontologists find treasure in this sudden wearing away. 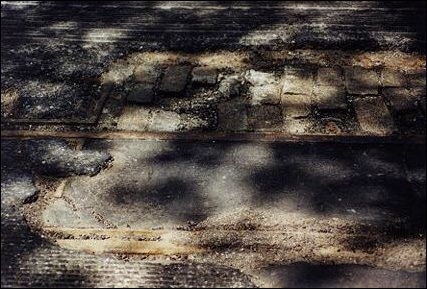 The Broadway streetcar tracks, unused for almost 50 years, are now making a partial appearance before being buried again for decades to come. And so it was that I found myself standing in traffic lanes and stepping carefully in the unknown territory of the center malls for a few days in May, camera in hand. UPDATE, June 6-11: Broadway has been repaved. 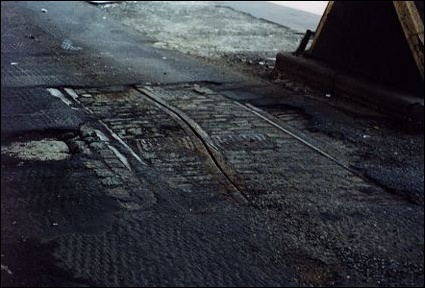 Along with the terrifically bad pavement, which is loose and wearing away further under the pounding of daily traffic, are rusty rails of sorts. They are most often seen in pairs, as at this exposure at 111th Street, but where the wearing away is more complete, we see all three of them. The streetcars of Manhattan (with a very few exceptions far uptown) were not trolley cars. In two US cities, Manhattan and Washington DC, local ordinances prohibited overhead wires, and so the power wire had to be taken underground, into a conduit. The usual analogy was to a trolley wire under the car instead of over. It's also the same idea as Lionel O-gauge toy trains, except that their low-powered center rail does not need to be hidden from accidental touch. 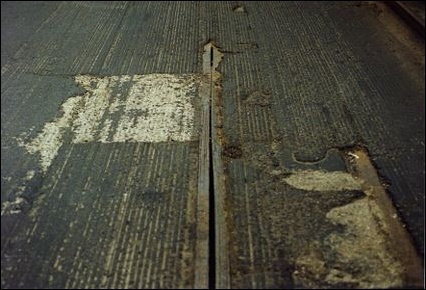 And it's the same as the subway's third rail along one side of the track. 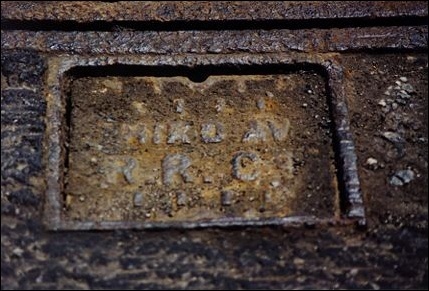 In the conduit system, there were a pair of T shaped rails with the "tops" facing each other: -| |- , charged at the usual trolley power of 500 to 600 volts of direct current, and contacted by a sliding collector called a plough that extended down from the car. The drawing shows a cross-section of the 125th Street cablecar track. Yes, there were cablecars in Manhattan once (but not here on Broadway), in the 1890's. The same track construction was applied to electric conduit track, so the illustration will apply here. The street surface is at the top of the diagram. At the right and left top corners, we see the running rails for the streetcar's wheels: unlike the simple capital I cross-section of railroad rails, these have a shelf along the inner side to hold open a path for the wheel flanges. In the center, we can make out the thin somewhat S shaped cross sections of the two iron edges of the conduit slot. In the photo, at one place the slot has become almost closed near a white concrete patch signifying some post-streetcar roadwork. In service, the slot had to be kept open between 5/8 and 3/4 inches by constant inspection. The diagram shows a cable grip coming from an unseen cable car down to hold one of the two cables in Manhattan's unusual two-cable system (the loose cable is below and right of the grip). 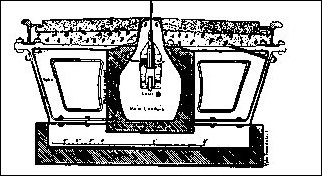 In the conduit system, the plough was smaller than the cable grip, which had to have moving parts. For that reason I think the inside dimension of the electric conduit was probably a bit smaller than this, but I'm not sure it was very much smaller. Most of that structure shown is cast iron. The dark area around the conduit is concrete poured on site. This isn't your basic track of two rails and wooden crossties. 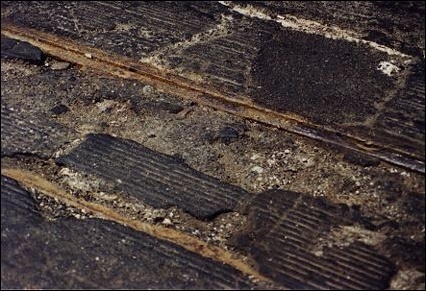 The track structure extends some two and a half feet into the earth. 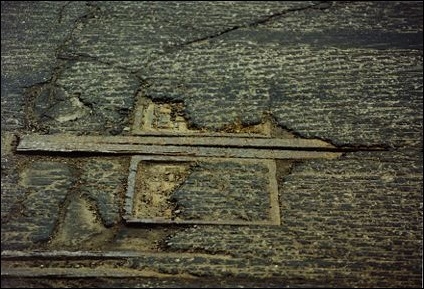 Under the paving blocks are cast iron yokes 5 feet apart, the trapezoidal shape shown here and in the previous line drawing. The yoke holds the shape of the lengthwise pieces, keeping the rails the right distance apart and keeping the conduit open. The diagram above shows a double-track cable installation, but the basics are the same on Broadway. 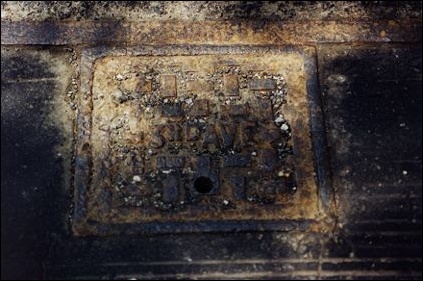 There is a yoke every 5 feet, and a pair of insulator covers around the conduit every 15 feet, and a cleaning manhole cover every 105 feet, of which every fourth one (420 feet apart) was also a slightly larger feeder manhole. It's a lot of cast iron and concrete. And you wondered why they didn't lift the tracks? But in some places they did lift this track. 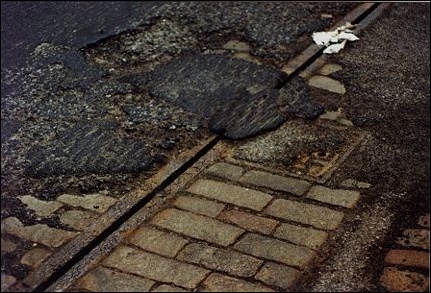 Look at the similar pavement work in Amsterdam Avenue (110th to 112th Streets), which had conduit cars, and you may have looked farther downtown this past year in Columbus Avenue, which was a cable line converted to conduit, and you don't see any track. On those lines, streetcars were discontinued about 1935. The Broadway cars ran until after the war, and by then no one wanted the scrap iron, or at least not enough to pay for mining this difficult ore. In most places, you can see only one of the pair of insulator manholes, just as you can usually see only the conduit and the rail closer to the center of the street. I think they may have scraped the street down a little more near the center mall curb. 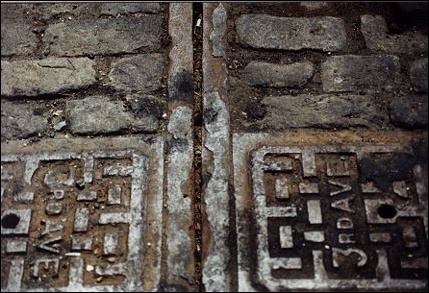 Here are two places where the pair of manholes are at least partially exposed, photographed on different days under very different lighting conditions. In the lower photo, you can see where the conduit has been broken off by some later streetwork that is not at all evident now. 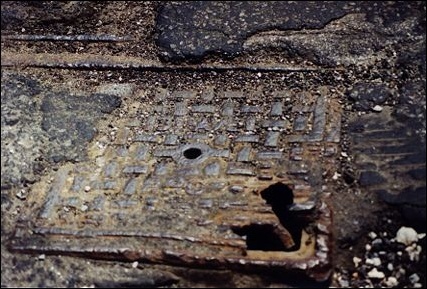 It looks like the insulator manholes needed new covers from time to time. Collect 'em all. In two of the above locations, only one side of the conduit is visible but that's what that rail is. Savor the detail on the corroded iron. The Broadway streetcar line was built by the Forty-Second Street, Manhattanville and St Nicholas Avenue Railway Company under a franchise granted in 1884. The Broadway line probably opened in 1885, and for most of its existence it ran just about the same route as the M104 bus does today, from First Avenue along 42d Street and Broadway and then 125th Street to the Hudson River. It became part of the Third Avenue Railroad System (TARS) in 1895 and was converted from horse power to electric conduit in about 1898. Thus, the covers all bear the name Third Avenue in some form. Every 105 feet-- because it's a multiple of the 15 feet between insulator manholes-- there was a cleaning manhole larger than the insulator manholes, although still less than 3 feet across, and it is not located between the rails but along the outer side of one running rail. UPDATE...May 27... I'm told there were scraper cars that pushed along street litter in the conduit up to the cleaning manholes, where it could be shovelled out. I now think that's what these two are, but I'm not so sure. 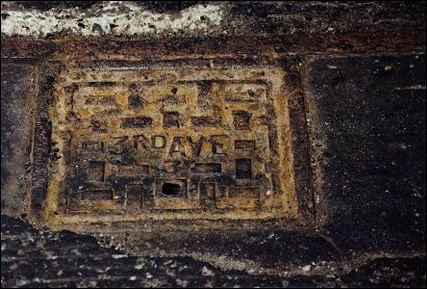 Every fourth one (420 feet) was a little larger, and called a feeder manhole because it also provided access to the electrical feeder running underneath the contact rails. These are harder to find exposed. The one at 113th Street actually has a hole in it, and the sunlight did not illuminate the bottom of the space underneath. 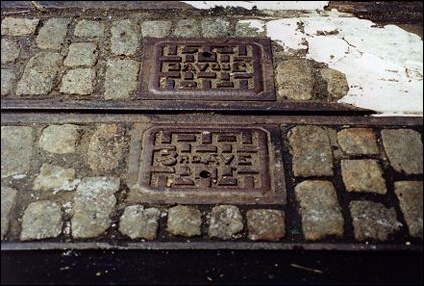 It says "3 AVE" somewhat like the conduit manhole covers. The only other one of these I could find is up near 122d Street and its cover has a different design. 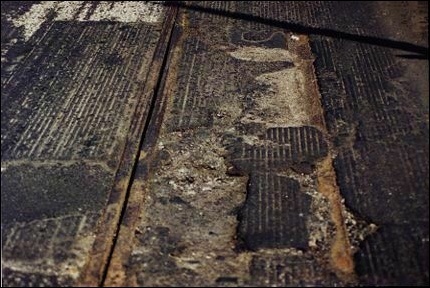 The original street pavement around the tracks was paving stones. UPDATE... August 27... I've heard from a few people about the technical name for these stones. I called them cobblestones, but although this is a popular term it is not correct for this type of stone. 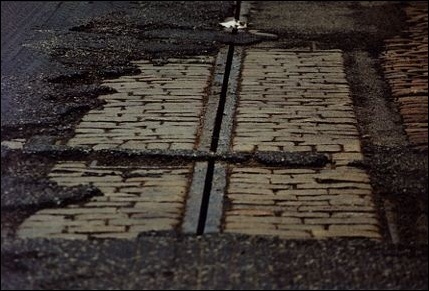 An American calls them Belgian Blocks, and a Canadian calls them setts. Here, up near Barnard, is an exposure showing paving stones, and this is also one of the few places where both running rails are visible, just barely. However, it's not a perfect sample section, since one side of the conduit slot has sunk, and it and the slot itself is covered by dirt. On the cover of the book Across New York by Trolley (Quadrant Press) is a color photograph of 42d Street taken some time in the 1940's. It shows a paving stone surface between the rails but smooth blacktop on the rest of the street. Broadway probably looked like this by the end of the streetcar era too, since photos with streetcars show a blacktop surface, but I can't find one where I can see clearly what's between the rails on Broadway. In the same book is a photograph taken in the 1940's showing two streetcars passing at the Barnard crosswalk, 117th Street, almost this location. Assuming you've seen all the good stuff right around Columbia is a mistake. When I finally took a walk up north of the campuses, I found the most fully exposed track in the whole roadwork project, just north of LaSalle Street. This stretch is in midblock alongside the stone wall where the IRT subway is rising out of its tunnel. The paving stones outside the rails are of a different, more yellowish stone. One feature I went looking for was switches. I was hoping to see how they got the plough to follow when the car faced into a turnout. But there are only two locations from 110th Street to 125th Street where there were switches, and almost nothing is visible at either. At 117th Street, there was a reverse crossover, a short diagonal track connecting the two main tracks. Some cars ended their runs from downtown at 117th Street, stopping just north of this crossing and then running back through the crossover into the downtown track. The diagonal itself is buried under the much later curbs and paving in the mall, and the scraping just didn't expose either of the switches, so there's nothing to see. At 125th Street, the track in Broadway ended, with curves both east and west into the 125th Street crosstown line. Broadway cars turned west and ran to the ferry at the Hudson River. 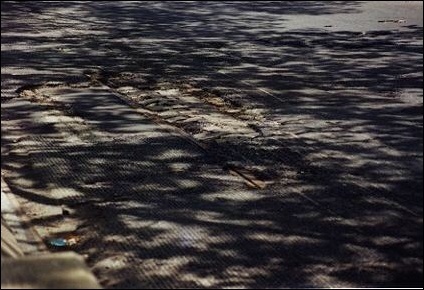 The end line of the scraped pavement seems to be just short of the switches, although the exposure of a lot of concrete near the end suggests the 125th Street track may have been removed anyway. But there was still something odd here, shown above. The conduit slot of the uptown track veers over to one side. Did this somehow help guide the plough through the switch that must have come within the next few feet? Sources indicate there was a "slot switch" to guide the plough, I suppose something like a track switch. 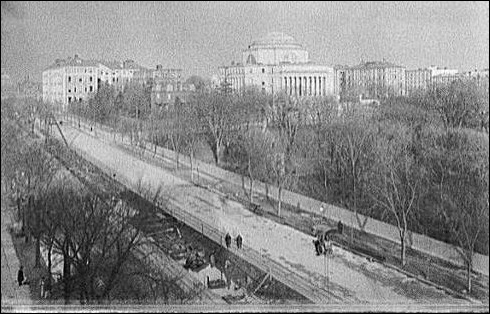 This photo of "Columbia College from the Southwest" shows the center mall of Broadway opened up for subway construction, and along the edges of the hole appear the conduit tracks of the Broadway streetcar line. 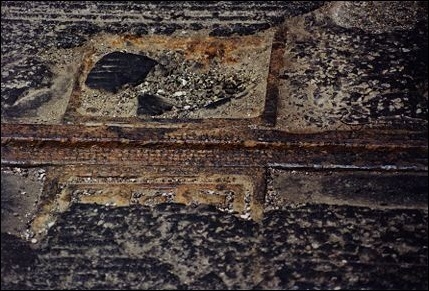 The subway had to underpin the conduit track, which was kept in service throughout the digging underneath. As completed, two subway tracks, the downtown local and center tracks, are under the mall, and the uptown local is under the street; and of course the station platforms extend under the street. The Columbia University station was originally reached from a house built in the mall on the north side of 116th Street, which was removed in 1969 when the sidewalk stairs were opened. Just north of the station the subway structure of steel bent and concrete jack arch changes to an early experimental use of reinforced concrete arch, which happens to include the area under the 117th Street streetcar crossover track. Two Third Avenue Railroad System streetcars from Manhattan have not only survived the years but can be ridden today at trolley museums. I think these two ran on Broadway, and I can find photographs of this series of cars on other conduit lines. Broadway cars did include roughly similar cars, some with center doors, built in the previous decade. Cars 629 and 631, shown here, were among 58 cars built in 1939 in the Third Avenue system's own shops at 65th Street and Third Avenue. They ran on Manhattan conduit routes until those closed, ran another year or so in the Bronx with trolley poles, and then, still only ten years old, they were sold to the system in Vienna, Austria, where they ran for almost two decades more. 629 was donated to the Shore Line Trolley Museum in 1967 and has run there ever since. 631 reached the Seashore Trolley Museum in 1981. Both have been restored to their Third Avenue system appearance. I don't know how long the Broadway paving project will take, but if you miss it, there is a permanent exhibit located in 12th Avenue between 125th Street and St Clair Place, that is, almost under the Riverside Drive Viaduct. 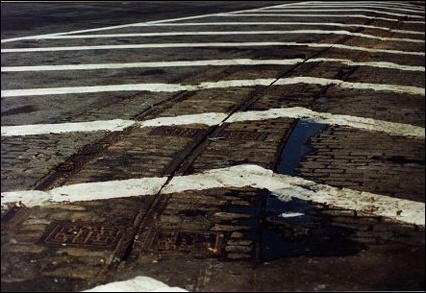 This is a turning loop built in 1910 at the end of the 125th Street crosstown line that has never been paved over, probably since it is in a "safety zone" between traffic lanes that have been repaved. 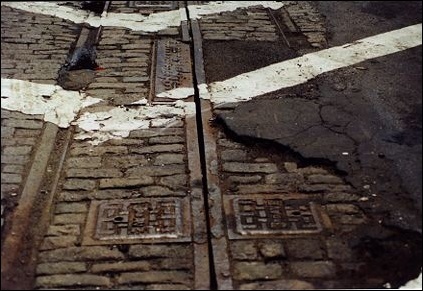 It's the same thing as on Broadway: paving stones, rusty iron rails, a conduit slot, pairs of insulator manholes every 5 feet. It also features some curvature and a long narrow hatch at one point along the conduit. Maybe it's anticlimactic to see a string of fully exposed insulator manhole covers here at 125th Street, after working so hard to find good ones up on Broadway. But the reward on Broadway is seeing different designs: they're all the same here. I checked. This place at 125th Street was about my only chance to stand right over the conduit slot and take my time getting a photograph looking down into it, without feeling like some speeding car would be on me in seconds. Anyway, it looks like it's pretty well filled up with garbage by now. 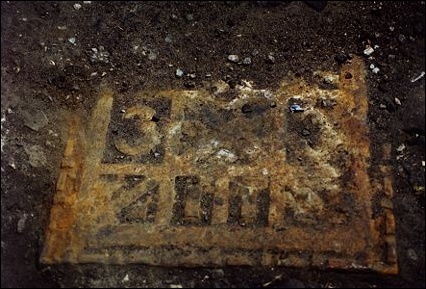 We'll finish with the mysterious hatch, which can be seen in the lower photo. It looks like there may have been a larger opening opposite it, extending the whole way from the conduit to the running rail (and beyond? ), since at exactly that point there are no paving stones but rather a blacktop patch. So what is it? UPDATE... May 27... I'd been wondering whether this might have been a plough pit, a place where someone could go down under the cars and put ploughs on and off, but maybe not. 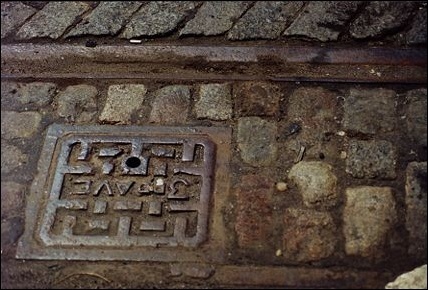 This one looks like it allows good access into the conduit, but I think the cleaning manholes are the large covers we saw before..
By Joe Brennan. All street photographs by Joseph Brennan. Copyright © 1996 by Joseph Brennan. All rights reserved.